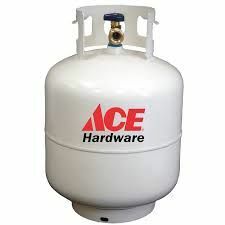 Bulk dispensing of propane is availabe at our location for all sizes of cylinders as well as motor homes with built in propane tanks. In addition, we offer a 20# propane cylinder exchange program which offers the best prices in town! $16.99 for an exchange (exchange tank must have a current date stamp and be in good condition) or 42.99 for a cylinder if you don't have an exchange. Purchase of new cylinders is available and if you have a cylinder that is out of date we will dispose of it for you at no charge.